Sue Wingate studied at Epsom Art School, followed by Winchester Art College, culminating in the Royal College of Art where she won two scholarships and obtained her degree. The following years were spent in Spain producing large landscapes, the majority held in private collections locally. Horses were a lifelong passion and equestrian studies took over the majority of her work resulting in many private and corporate commissions. ‘The turf’ became the bedrock of her commissions and her love of nature evident in the detailing of the landscapes. Due to the level of demand Sue had few exhibitions, she did, however, exhibit in; Kentucky, Doncaster Museum and Art Gallery and in Newmarket, at Palace House, home of The National Horseracing Museum. 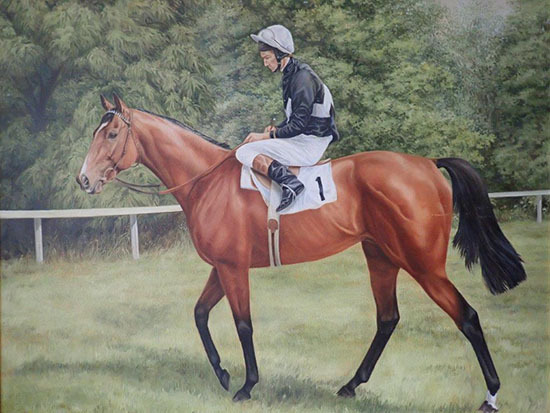 The National Horseracing Museum graciously accepted her bequest and will display her painting of Ardross next Spring. Notable commissions included: The Spirit of the St Ledger for Doncaster Museum and Art Gallery, Teenoso twice for the late owner, E B Moller, Chief Singer twice for the owner, Mr J C Smith, Desert Orchid, One Man – so the list goes on. 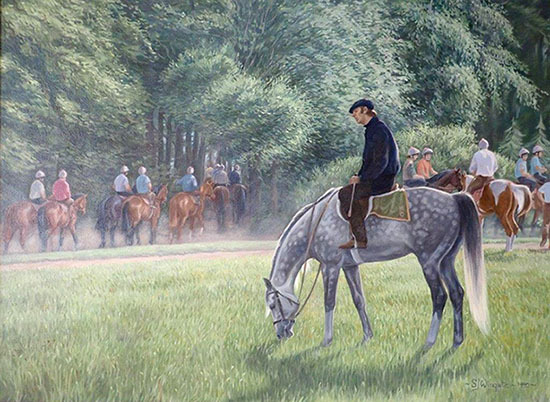 Two notable paintings were for competitions run by the Sun/Times Newspaper Group and Telegraph magazine, Corbiere winning the Grand National and a tight Derby finish, Secreto and El Gran Senor, respectively. There are very few remaining notable works of Sue Wingate that are not already in private collections. All images in this section are copyright of the owners. No reproduction without permission.